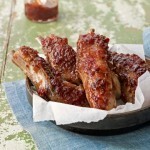 Place ribs in a large Dutch oven or stock pot; and add water to the depth of about 1 inch; cover and bring to a boil. Reduce heat and simmer for 1 hour. In 1-quart saucepan, mix together remaining ingredients. Simmer for 10 minutes. Drain ribs; brush with sauce. Grill, basting and turning frequently, for about 20 minutes, or until browned.